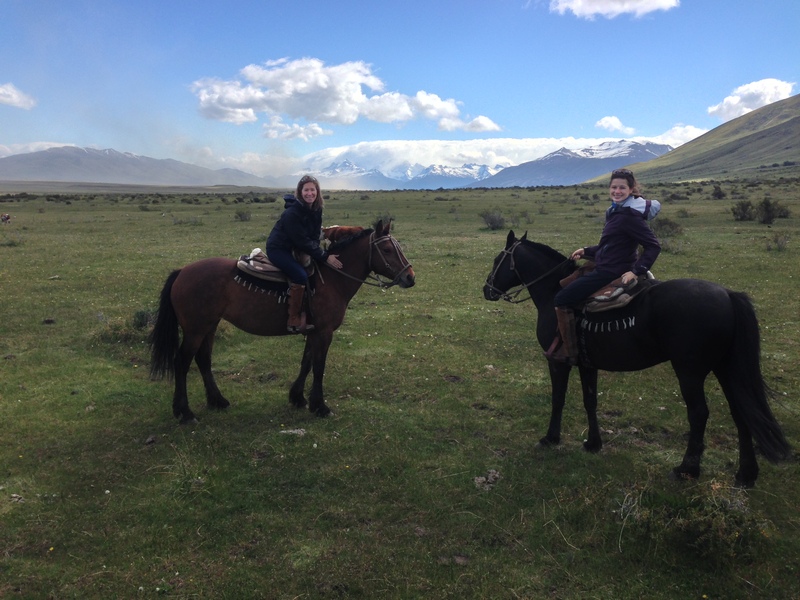 Nicole was spending the fall semester of her junior year studying in Buenos Aires, and my journey to visit her would last six days, three in her newly adopted city, Buenos Aires, and three in the southern region of Patagonia. Her itinerary covered our three days in BA, with each day’s plans listed is chronological order. “Brunch in Palermo at either Voulez-Vous or Bartola”, read one event; “Cemetario and MALBA museum (Av. Pres. Figueroa Alcorta 3415)” was proposed for another. There were addresses, reservation times, neighborhoods pinpointed and even links so I could choose between restaurants. Upon my morning arrival, I headed straight to the hotel where Nicole, my roommate for the following three nights, was waiting. The Hub Porteño, a cozy and elegant 11-room boutique hotel, is made to feel like a home rather than a hotel. Situated in the tony section of Recoleta with its beautiful galleries, cafes and parks, the hotel’s concierge (our favorite was Martin who takes his job very seriously) emerges from a hidden office when he hears people gathering by the elevator or in its neighboring “living room”. Not to be missed: a visit to the stylish rooftop area and its open air lounge. There’s also a gym and sauna up there, but I was too busy eating, drinking and sightseeing to visit. 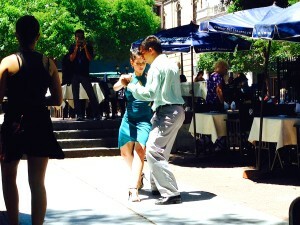 Tango dancers grace the sidewalks. As planned by my personal guide, we had a delicious brunch at Bartola in the Palermo neighborhood – sort of like what Soho used to be. It was a balmy Spring day, and we sat outside on pink wooden chairs, watching people stroll along the cobblestone streets that are dotted with chic boutiques, bars and cafes. Since muggings are about as common as psychoanalysis in Buenos Aires, Nicole warned me never to take out my iPhone or leave my purse open – so be forewarned. After Palermo, we stumbled upon the Jardin Botanico Carlos Thays, a botanical park lined with manicured paths and sprinkled with school children on outings and couples strolling. We noticed a group of tourists on a Biking Buenos Aires tour, which seems like a great way to tour the city. Walking through the city streets, we could smell the sweet blossoms of the purple jacaranda trees in full bloom. 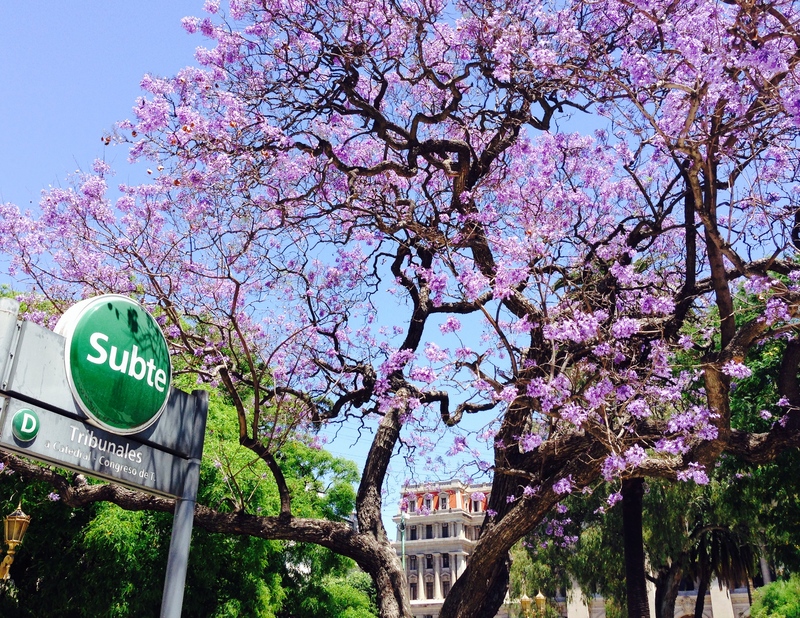 Next stop was one the city’s most fascinating – the Cementerio Recoleta, a labyrinth of above-ground mausoleums. Many famous Argentine figures are buried here, including Eva Peron. The fun here is getting lost among the long outdoor corridors, peaking inside the mausoleums, at times coming across recently laid flowers, candles, photos and even candy. On our walk back to Hub Porteño, we strolled by the famous cafes – notably La Biela – where people sit for hours, sipping café or an aperitif and lazing the afternoon away. Vegetarians beware, Argentina is the beef capital of the world. Nicole scored us a table at one of they city’s more famous parillas (pronounced par-ee-jas), Cabaña las Lilas. 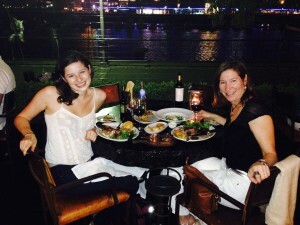 Seated in the outdoor area along the main canal of Puerto Madero, we sipped a local Malbec wine, started our feast with provoleta (grilled provolone cheese) and salad before moving on to two cuts of succulent beef which we topped with chimichurri sauce. 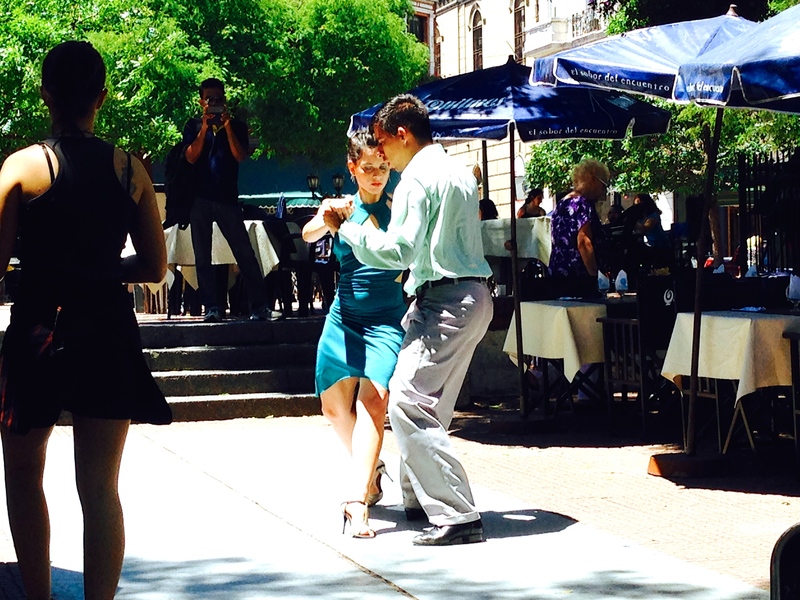 The following day, we walked through Recoleta and along the Avenida Santa Fe. 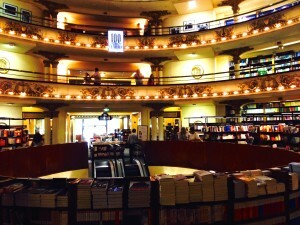 Nicole had a class to attend, and urged me to make a stop at her favorite shop, a bookstore called El Ateneo. 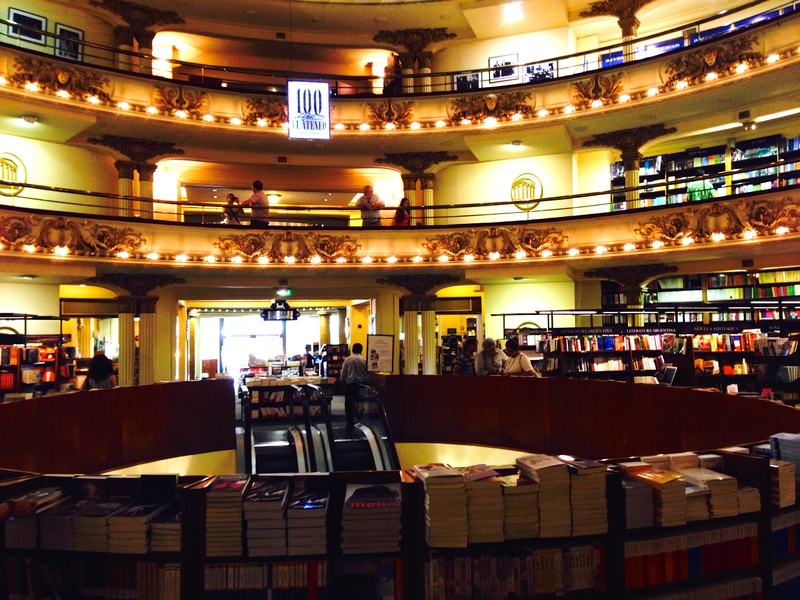 Originally a theater built in 1919, El Ateneo was converted into an enormous bookstore in 2000 and its ornate architectural details are preserved – there’s a cafe and huge book selection (in Spanish). I had hoped to take a tour of the Teatro Colon opera house, but was unable to get a convenient time slot (get tickets in advance if possible), so continued my day walking through the streets of San Telmo, the city’s oldest neighborhood, starting at the Plaza Dorrego which houses a bustling flea market on Sundays. While in Buenos Aires, I learned that Nicole is not only adept at trip planning, but she’s also talented at exchanging black market money. I met her outside of her school and we walked to Calle Florida to make “cambio” with her guy – a personal source for pesos at nearly double the exchange than one gets at a bank. I followed my daughter who slyly entered a small kiosk – yes, newspapers and gum were also for sale – but the real industry appeared to come from the numbers he presented to my daughter on a calculator. She nodded okay, lifted a few bills into the air to check that they were real, and counted her cash. Mission accomplished. Mother impressed. Our next stop was the nearby Plaza de Mayo – the city’s main square and location of the May 25th 1810 revolution that led to Argentina’s independence from Spain. It is also the hub of all political protests in Argentina. 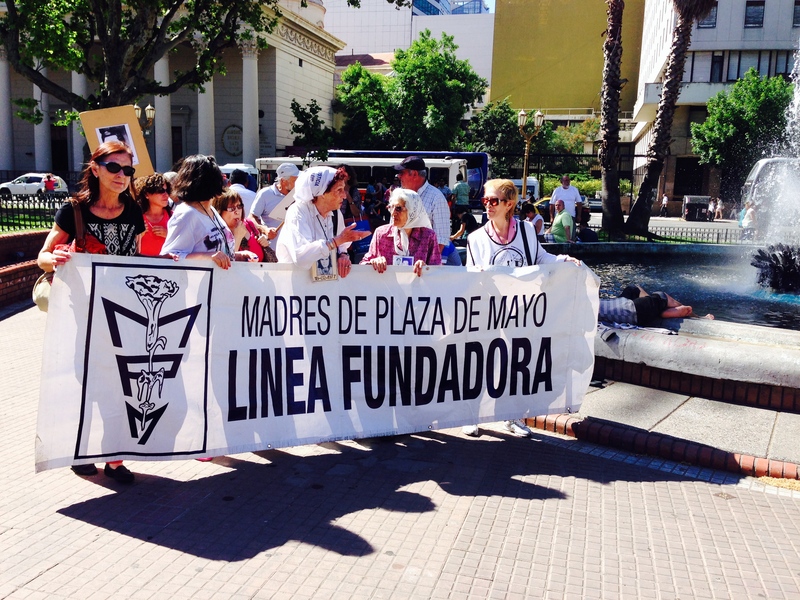 We were there to watch the weekly, Thursday at 3:30 pm march of Las Madres – a group of mothers of the Dirty War’s “disappeared” children. Some of these women have been marching weekly since 1977, and it was moving to see them continue their plight in their advanced age. Las Madres during their weekly march. The evening began with Gallery night, a city-sponsored event that takes place the second Thursday of each month in many art galleries of Palermo and Recoleta. Open from 7 to 10 pm, galleries serve drinks and some have music. After a few stops, we headed to the bar at the Algodon Mansion hotel for some wine tasting and jazz, before heading to the 10 pm tango show at Café los Angelitos. We opted to skip the pre-show dinner, and showed up at the historic café just a few minutes before show time. Yes it’s touristy, but is an upbeat, entertaining performance and fun to watch the tango come alive. 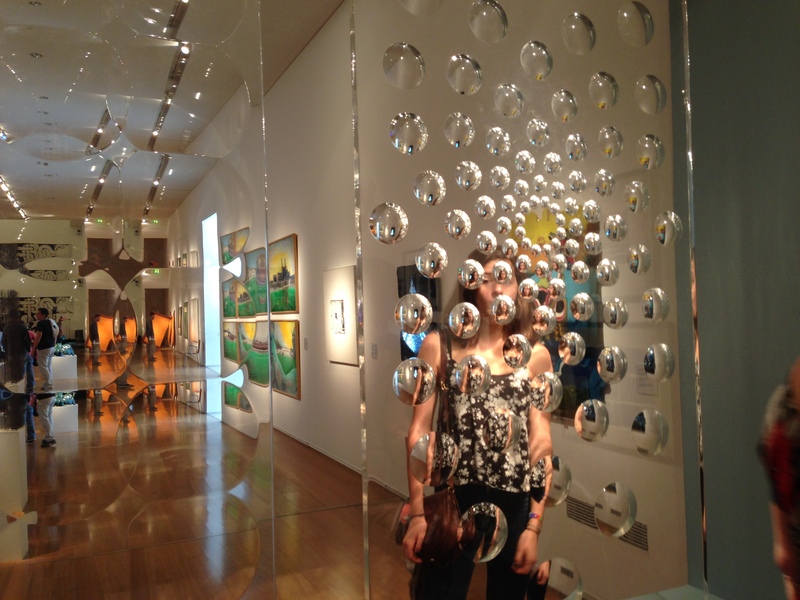 On our last day in the city, we headed to MALBA, the city’s museum of contemporary Latin American art. While the museum features art by 20th century painters such as Frida Khalo and Diego Rivera, there are a large number of modern installations and artists, and we were lucky to see an incredible solo exhibition by Liliana Porter. 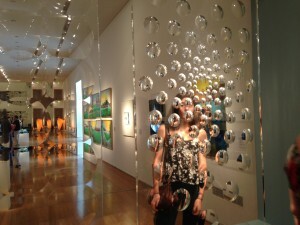 At the contemporary MALBA museum. After the museum and an afternoon of strolling and shopping, we headed to the Communidad Amijai, a synagogue in the less central Belgrano neighborhood. A contemporary-looking sanctuary made of wood and stone, the place was packed with young and old, dressed casually in jeans and singing along through the entire Friday night service – accompanied by bongo drums, guitar, piano and violin. It was a beautiful way to experience a Shabbat service in a foreign country. Afterwards, we headed to dinner at Osaka, a Japanese-Peruvian fusion restaurant where the blend of ceviche and sushi was mouthwatering, not to mention the amazing cocktails. Three days chock full of urban activity quickly transformed into several more of spectacular nature and adventure. 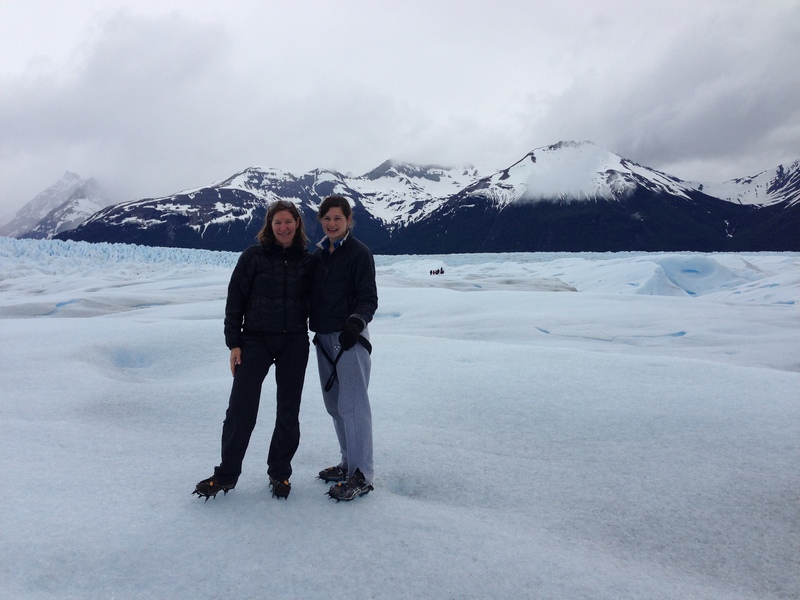 An early morning, three-hour flight took us to El Calafate in Argentina’s most southern region of Patagonia. We headed straight to Eolo, our home for the following two nights and a slice of heaven set in the middle of the La Anita valley on the eastern side of Mount Frias. Depending from which window you look out, you may see the Lago Argentino towards the North, the valley and mountains towards the east and the Torres del Paine and the Rico branch of the lake towards the south. After lunch looking out over a valley, snow covered mountain tops and the azure blue lake, we met Roberto for a horse back riding excursion. My horse was Electra, a 13-year-old beauty who, while slow to pick up her pace, was as sweet as can be. With Roberto leading us, we climbed the mountain, coming across large hares, grazing horses, cows, falcons, and eagles along the way. Roberto told us about the wide range of mountains stretching into Chile, the varying temperature changes and all the animals and birds we encountered. Once we descended from the mountain, we crossed the valley, coming across a flock of pink flamingos and more cows who ran away from Roberto’s intrepid puppy, Truco. After three hours on horseback, we relaxed our tired legs in the lobby, peering out the windows at the sublime scenery. Dinner is a casual, yet serious affair at Eolo – there is a choice of three entrees and that night, ours (prawn ravioli) was divine. Lamb is the region’s local specialty and needless to say, there is plenty of beef to be eaten. 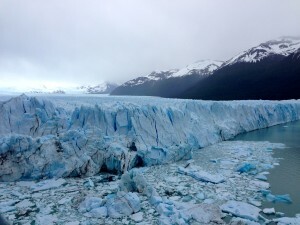 We woke early the following day to board a coach bus filled with adventurers from all over the world for our full day “Big Ice” trek to the Perito Moreno glacier. Eolo had arranged for us to join the Hielo y Aventura tour, and our guide, Sylvia, explained the day’s itinerary which began with a visit to the catwalks, composed of several levels andviewing points from which to see the glacier up close. 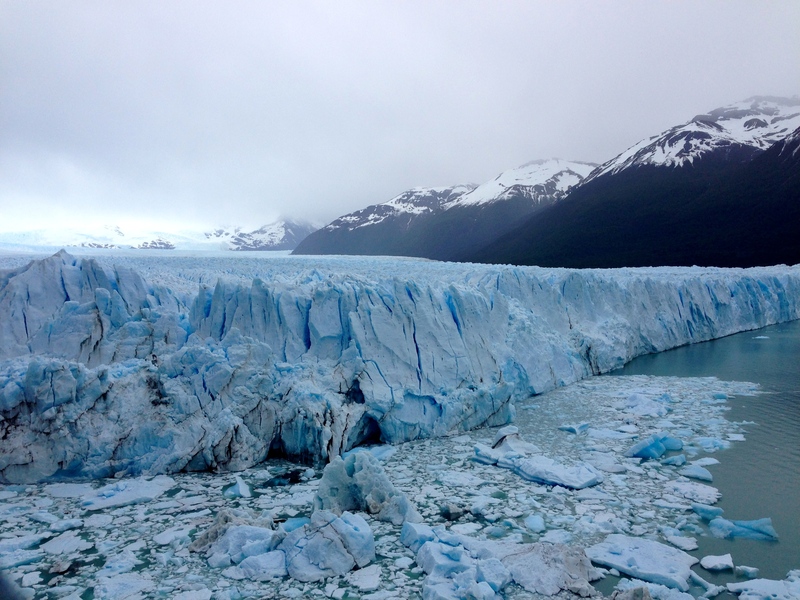 From each balcony, the glacier looks no less impressive, particularly when you can hear a giant crash of falling ice taking place somewhere inside the vast glacier – equivalent in size to the entire city of Buenos Aires. After the catwalks, the bus drove us to a small port from where we took a boat across the lake in front of the glacier to begin our “Big Ice” excursion. Once on the other side, we were separated into English and Spanish speaking groups. We followed our guide, Julio, walking through the forest for 15 minutes and onto a muddy beach area in front of the glacier. We then began a one-hour hike up the moraine, a fairly steep climb that took us in and out of the of forest – the enormous glacier never leaving site on our right. Julio explained that we’d be trekking 12 km (roughly 7.5 miles) on the ice, would stop once for lunch (we chose smoked salmon sandwiches caringly prepared by Eolo) and face challenging ice terrain and large sink holes. My daughter had been emphatic about this rigorous excursion (the “mini” ice trek involves walking 2 km with several stops to rest), and by now I was feeling adventurous, inspired by all these young people (ugh) and the variety of nationalities represented in our group (German, Australian, and French to name a few). The hike was in itself pretty strenuous and we kept a rapid pace. It started to rain and Julio stopped at one point to put on a pair of rain pants. I put my gloves on and off, trying to figure out what felt better with the changing temperature of my body and the constant variations in the weather. We eventually reached a tent where a staff of guides put harnesses on each of us (safety protocol) and then fastened crampons – metal spikes – to the bottom of our hiking boots. Once on the glacier, we divided into even smaller groups, and were joined by an additional guide who would be circling around us, helping to figure out the safest route on the icey surface, which changes every few days due to the glacier’s constant movement. The crampons felt strange at first, but began to feel natural after a few minutes of walking and digging into the ice beneath. Julio explained how sink holes develop and gave us background on the Perito Moreno lake glacier. We were welcome to fill up our bottles with the glacier’s puddling water, Julio offered – the purest, most refreshing I’d ever tasted. The blue colors beneath the ice were an optical illusion, he also explained, signifying nothing more than deeper packed ice. We trekked for miles on the glacier. Note the crampons. After two hours trekking across the glacier, we sat down and ate our lunch. It was a chance to chat about the tradition of drinking mate (pronounced ma-tay), a subject Argentines are deeply passionate about, and talk to the other trekkers about travel experiences (one Aussie-Columbian civil engineer couple were at the end of a two month holiday through South America). The trek was challenging and invigorating, and just about every person on the bus fell asleep on the way back – the whiskey poured over glacier ice on the boat ride back may have helped initiate the slumber. Nicole and I spent our last morning hiking up the mountain behind Eolo, taking in our final views of the lake, the snow covered Andes in the distance and the far reaching, lush valley floor. Only six days in Argentina with my adventure companion and personal Buenos Aires guide. A trip that only whet my appetite for more time – and steak – in these parts.